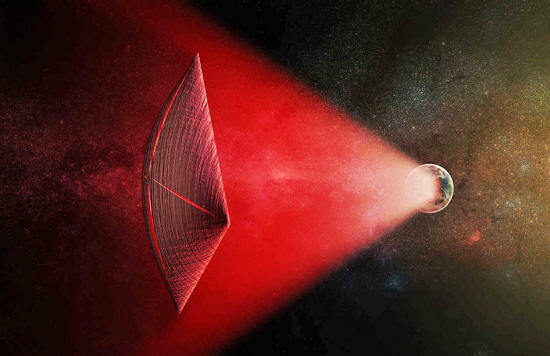 Could Mysterious Cosmic Light Flashes be Powering Alien Spacecraft? powered by a radio beam (red) generated on the surface of a planet. known as fast radio bursts, according to a new study. Bizarre flashes of cosmic light may actually be generated by advanced alien civilizations, as a way to accelerate interstellar spacecraft (below video) to tremendous speeds, a new study suggests. Astronomers have catalogued just 20 or so of these brief, superbright flashes, which are known as fast radio bursts (FRBs), since the first one was detected in 2007. FRBs seem to be coming from galaxies billions of light-years away, but what's causing them remains a mystery. "Fast radio bursts are exceedingly bright given their short duration and origin at great distances, and we haven't identified a possible natural source with any confidence," study co-author Avi Loeb, a theorist at the Harvard-Smithsonian Center for Astrophysics, said in a statement Thursday (March 9). "An artificial origin is worth contemplating and checking." One potential artificial origin, according to the new study, might be a gigantic radio transmitter built by intelligent aliens. So Loeb and lead author Manasvi Lingam, of Harvard University, investigated the feasibility of this possible explanation. The duo calculated that a solar-powered transmitter could indeed beam FRB-like signals across the cosmos - but it would require a sunlight-collecting area twice the size of Earth to generate the necessary power. And the huge amounts of energy involved wouldn't necessarily melt the structure, as long as it was water-cooled. So, Lingam and Loeb determined, such a gigantic transmitter is technologically feasible (though beyond humanity's current capabilities). Why would aliens build such a structure...? The most plausible explanation, according to the study team, is to blast interstellar spacecraft to incredible speeds. These craft would be equipped with light sails, which harness the momentum imparted by photons, much as regular ships' sails harness the wind. Indeed, a transmitter capable of generating FRB-like signals could drive an interstellar spacecraft weighing 1 million tons or so, Lingam and Loeb calculated. "That's big enough to carry living passengers across interstellar or even intergalactic distances," Lingam said in the same statement. Humanity would catch only fleeting glimpses of the "leakage" from these powerful beams (which would be trained on the spacecraft's sail at all times), because the light source would be moving constantly with respect to Earth, the researchers pointed out. The duo took things a bit further. Lingam and Loeb acknowledge the speculative nature of the study. They aren't claiming that FRBs are indeed caused by aliens. Rather, they're saying that this hypothesis is worthy of consideration. "Science isn't a matter of belief; it's a matter of evidence," Loeb said. "Deciding what's likely ahead of time limits the possibilities. It's worth putting ideas out there and letting the data be the judge." The new study (Fast Radio Bursts from Extragalactic Light Sails) has been accepted for publication in The Astrophysical Journal Letters.